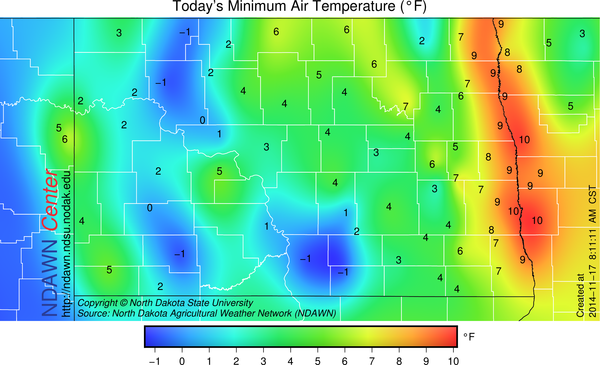 Cloud cover and a few flurries overnight kept the temperature a bit warmer in the Red River Valley (RRV) than in other parts of the NDAWN mesonet, but it was cold for the time of the year for everyone as the RRV was only a few degrees warmer. Besides a thicker cloud cover, another reason the RRV was a touch warmer than other areas this morning was the wind. The subtly stronger wind helps keep the air well mixed which helps keep the temperature a bit warmer than it otherwise would have dropped to. 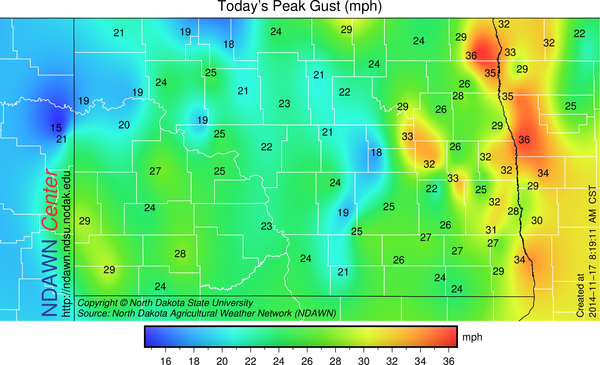 The wind will stay up throughout the day with the strongest wind speeds likely remaining in eastern North Dakota into western Minnesota as that is where the tightest pressure gradient will reside. A northwest wind at 15-30 mph is expected. The cold front that passed through the region yesterday is currently near Chicago to St. Louis to a near Oklahoma City line and pushing southeast. High pressure will be moving in behind the front and dominate our weather for the next few days. 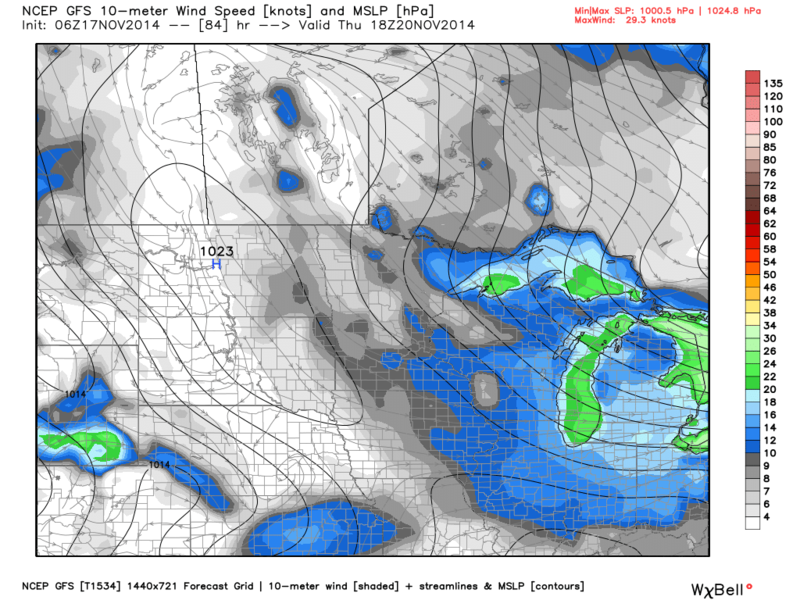 The core of the high pressure will not move into North Dakota until Thursday. Meaning there will be a noticeable pressure gradient and some corresponding wind for the next several days, although the wind speeds today are likely going to the strongest of the next several days. Once that high pressure center finally moves through and sinks to our southeast, it appear that a brief warm up will occur this weekend. High temperatures both Saturday and Sunday would have the potential to exceed 32° both days, with the warmer readings in the locations with minimal snow cover. There will be a weak disturbance on Wednesday that may bring some flurries or a light dusting of snow, otherwise, the working week looks dry. Part of the warm up this weekend will be in association with an area of low pressure that will be moving across southern Canada that will place North Dakota and northern Minnesota in the warm sector of that system. Yet, behind that low will be another cold front that will likely cool us back off significantly once again as we move toward Thanksgiving. High temperatures this week generally in the upper 10s to lower 20s. Breezy the next few days. This weekend that chance of breaking the freezing barrier. Generally quiet but cold weather continuing.